Guarding the eastern flank of NATO forces in Hameln against a Soviet Tank Regiment is not going to be an easy task. In this blog entry, the tactical plan for an scenario based in HPS Simulation's North German Plain 85 and played in Steel Beasts ProPE. Thanks to Koen for crafting this great scenario! In the small hours of July 16, 1985, the Soviets launched a daring special forces airborne operation in Hameln. Caught by surprise, NATO commanders threw a mix of ragtag units on the desants, with the hopes of assembling a better fitted task force by mid day. Special forces or not, the actual fear of having Soviet units popping up within one's interior lines arises from the certainty that nearby an offensive operation of a bigger scale is about to rip the FLOT like an elephant charging a garden fence. The giant pachyderm analogy can be expanded to the Soviet's tempo of operations: relatively slow to get started and almost unstoppable when it picks up momentum. A battalion of the 2nd Panzer Brigade (2Pz.Bde.) was the spearhead of a bigger formation sent to aid the NATO forces already engaged in Hameln. It marched to the area of operations with no other thought than smashing the Soviets in Hameln. 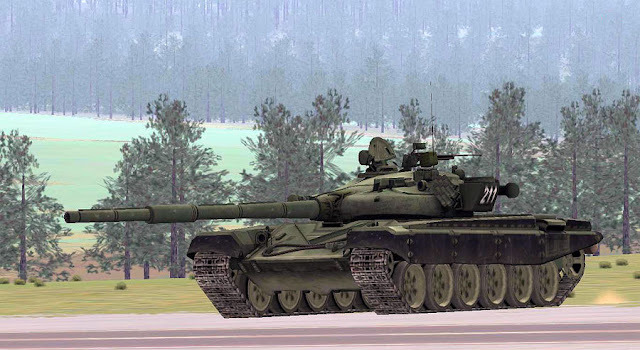 One hour before the link up with the rest of the NATO forces, SIGINT from the Corps tactical HQ clearly indicated that a Soviet tank regiment belonging to the 9th Tank Guards Division was at the final stages of the complex choreography that precedes an approach march. An angry elephant is not prone to be inconspicuous. The German battalion commander had made previsions for the flank protection of his command, but in reality those plans were just wishful thinking. The battalion was moving west in a terrain with plenty of hill ridges running in the north-south direction. Parallel routes to the main body's were infrequent or ran for very short spans. For all practical matters, the battalion was moving in a single column with the occasional platoon separating from the main body for a very short reconnaissance. Upon the receipt of the news about the Soviet tanks getting ready to relieve Hameln from the southeast, a course of action was decided after a combination of rushed roadside conversations in front of maps clinging to armor hulls and radio transmissions from cramped compartments of tanks and infantry fighting vehicles. Of the 4 companies that the battalion, Companies A (panzers) and B (panzergrenadiers) were to split from the main body and stay 7 kilometers east of Hameln for a hasty defensive operation. The main objective of that operation was to avoid the Soviets tanks reaching Hameln. In the next installment, the tactical plan.